In physics, quasiparticles and collective excitations (which are closely related) are emergent phenomena that occur when a microscopically complicated system such as a solid behaves as if it contained different weakly interacting particles in free space. For example, as an electron travels through a semiconductor, its motion is disturbed in a complex way by its interactions with all of the other electrons and nuclei; however it approximately behaves like an electron with a different mass (effective mass) traveling unperturbed through free space. This "electron with a different mass" is called an "electron quasiparticle". In another example, the aggregate motion of electrons in the valence band of a semiconductor or a hole band in a metal is the same as if the material instead contained positively charged quasiparticles called electron holes. Other quasiparticles or collective excitations include phonons (particles derived from the vibrations of atoms in a solid), plasmons (particles derived from plasma oscillations), and many others. These particles are typically called "quasiparticles" if they are related to fermions, and called "collective excitations" if they are related to bosons, although the precise distinction is not universally agreed upon. 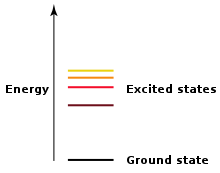 Thus, electrons and electron holes are typically called "quasiparticles", while phonons and plasmons are typically called "collective excitations". There is a difference in the way that quasiparticles and collective excitations are intuitively envisioned. A quasiparticle is usually thought of as being like a dressed particle: it is built around a real particle at its "core", but the behavior of the particle is affected by the environment. A standard example is the "electron quasiparticle": an electron in a crystal behaves as if it had an effective mass which differs from its real mass. On the other hand, a collective excitation is usually imagined to be a reflection of the aggregate behavior of the system, with no single real particle at its "core". A standard example is the phonon, which characterizes the vibrational motion of every atom in the crystal. A dislon is a quantized field associated with the quantization of the lattice displacement field of a crystal dislocation. It is a quantum of vibration and static strain field of a dislocation line. ^ a b c d e f E. Kaxiras, Atomic and Electronic Structure of Solids, ISBN 0-521-52339-7, pages 65–69. ^ Ashcroft and Mermin (1976). Solid State Physics (1st ed.). Holt, Reinhart, and Winston. pp. 299–302. ISBN 978-0030839931. ^ a b c A guide to Feynman diagrams in the many-body problem, by Richard D. Mattuck, p10. "As we have seen, the quasiparticle consists of the original real, individual particle, plus a cloud of disturbed neighbors. It behaves very much like an individual particle, except that it has an effective mass and a lifetime. But there also exist other kinds of fictitious particles in many-body systems, i.e. 'collective excitations'. These do not center around individual particles, but instead involve collective, wavelike motion of all the particles in the system simultaneously." ^ Ohtsu, Motoichi; Kobayashi, Kiyoshi; Kawazoe, Tadashi; Yatsui, Takashi; Naruse, Makoto (2008). Principles of Nanophotonics. CRC Press. p. 205. ISBN 9781584889731. ^ Gelfert, Axel (2003). "Manipulative success and the unreal". International Studies in the Philosophy of Science. 17 (3): 245–263. CiteSeerX 10.1.1.405.2111. doi:10.1080/0269859032000169451. ^ Goldman, Vladimir J (2007). "Fractional quantum Hall effect: A game of five halves". Nature Physics. 3 (8): 517. Bibcode:2007NatPh...3..517G. doi:10.1038/nphys681. ^ "Josephson Junctions". Science and Technology Review. Lawrence Livermore National Laboratory. ^ J. E. Hoffman; McElroy, K; Lee, DH; Lang, KM; Eisaki, H; Uchida, S; Davis, JC; et al. (2002). "Imaging Quasiparticle Interference in Bi2Sr2CaCu2O8+δ". Science. 297 (5584): 1148–51. arXiv:cond-mat/0209276. Bibcode:2002Sci...297.1148H. doi:10.1126/science.1072640. PMID 12142440. ^ Banerjee, A.; Bridges, C. A.; Yan, J.-Q. ; et al. (4 April 2016). "Proximate Kitaev quantum spin liquid behaviour in a honeycomb magnet". Nature Materials. 15 (7): 733–740. arXiv:1504.08037. Bibcode:2016NatMa..15..733B. doi:10.1038/nmat4604. PMID 27043779. (Subscription required (help)). ^ Shaginyan, V. R.; et al. (2012). "Identification of Strongly Correlated Spin Liquid in Herbertsmithite". EPL. 97 (5): 56001. arXiv:1111.0179. Bibcode:2012EL.....9756001S. doi:10.1209/0295-5075/97/56001. ^ Schmidt, Richard; Lemeshko, Mikhail (18 May 2015). "Rotation of Quantum Impurities in the Presence of a Many-Body Environment". Physical Review Letters. 114 (20): 203001. arXiv:1502.03447. Bibcode:2015PhRvL.114t3001S. doi:10.1103/PhysRevLett.114.203001. PMID 26047225. ^ Lemeshko, Mikhail (27 February 2017). "Quasiparticle Approach to Molecules Interacting with Quantum Solvents". Physical Review Letters. 118 (9): 095301. arXiv:1610.01604. Bibcode:2017PhRvL.118i5301L. doi:10.1103/PhysRevLett.118.095301. PMID 28306270. ^ "Existence of a new quasiparticle demonstrated". Phys.org. Retrieved 1 March 2017. ^ Xu, S.Y. ; Alidoust, N.; Chang, G.; et al. (2 June 2017). "Discovery of Lorentz-violating type II Weyl fermions in LaAlGe". Science Advances. 3 (6): e1603266. Bibcode:2017SciA....3E3266X. doi:10.1126/sciadv.1603266. PMC 5457030. PMID 28630919. ^ Li, Mingda; Tsurimaki, Yoichiro; Meng, Qingping; Andrejevic, Nina; Zhu, Yimei; Mahan, Gerald D.; Chen, Gang (2018). "Theory of electron–phonon–dislon interacting system—toward a quantized theory of dislocations". New Journal of Physics. 20 (2): 023010. doi:10.1088/1367-2630/aaa383.